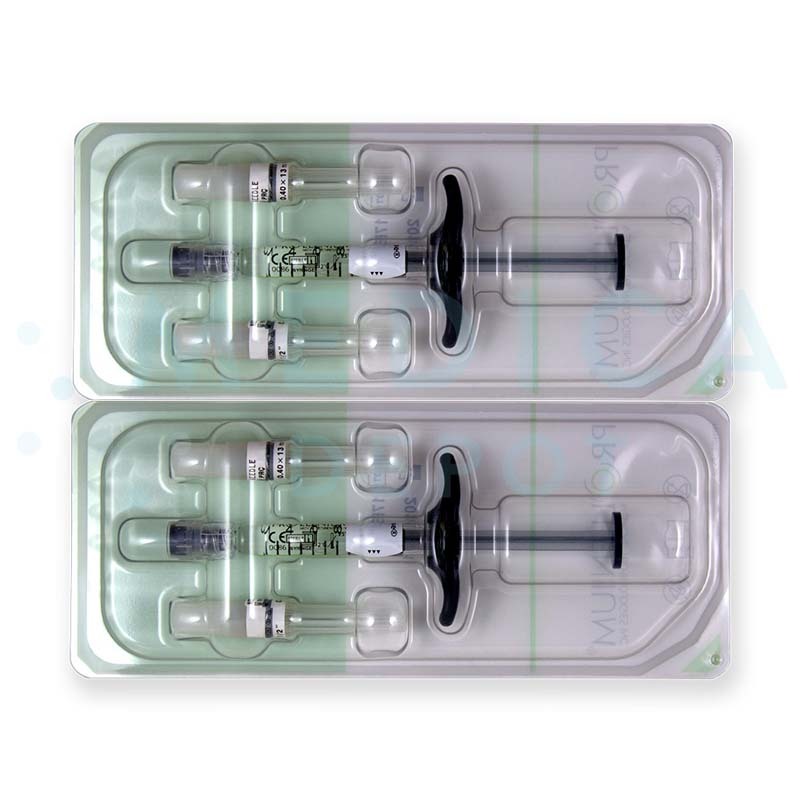 You can buy Revanesse 1 ml syringes and order online from us. Save money with our low wholesale prices and free shipping options. You can also order by phone, or via fax and have products delivered right to your clinic. Contact our customer service representatives if you need assistance placing your order. We carry a wide selection of Revanesse fillers. Click here to shop for more Revanesse dermal fillers. 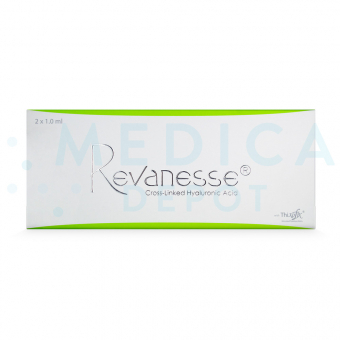 Revanesse is a dermal filler made of non-animal hyaluronic acid gel. The manufacturer produces this gel using Thixofix cross-linking technology, with a unique milling process that creates rounder, more homogenous particles. Because of this, the final product tends to last longer, and you can shape and mold the gel until you obtain the desired results. Additionally, the gel is easier to inject than others, making treatments more comfortable for you and your patient. What are the benefits of buying Revanesse? 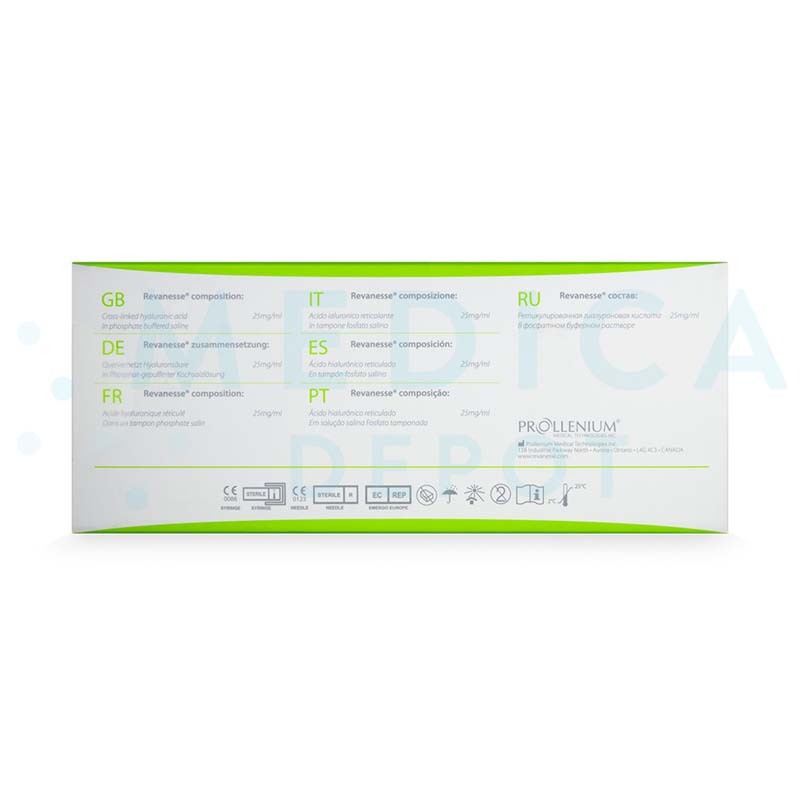 Genuine, brand-name dermal filler from Prollenium, an innovative aesthetic product manufacturer. Made with hyaluronic acid, a natural substance trusted for its aesthetic benefits. Hyaluronic acid particle shape helps create a more moldable product. Not created with animal products, so it is less likely to cause an allergic reaction. Lasts at least 6 months. This dermal filler is made of hyaluronic acid, a substance found naturally within the body. This hyaluronic acid binds naturally to water molecules within the skin, allowing it to volumize and hydrate the dermis upon injection. This increased volume supports skin to smooth the look of wrinkles and fine lines for a more youthful and rejuvenated appearance. What are the ingredients in Revanesse filler? This dermal filler is made of cross-linked hyaluronic acid in the form of an injectable gel. This non-animal formula is created by the fermentation of Streptococci bacteria, so it is less likely to trigger an allergic reaction than hyaluronic acid sourced from rooster combs. What is the difference between this and other Revanesse fillers? 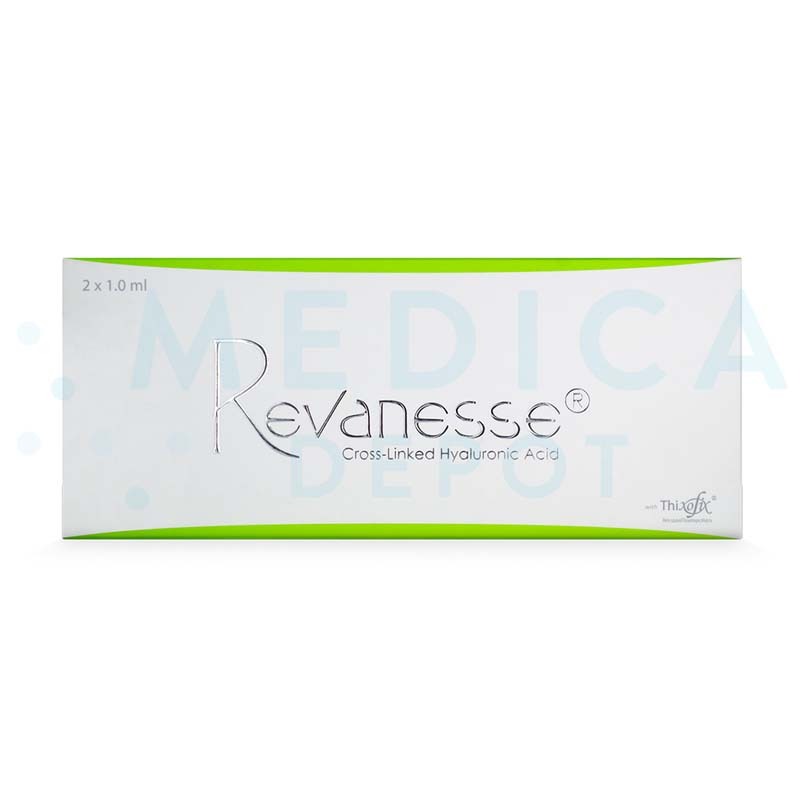 This particular dermal filler has a consistency suitable for treating fine lines and other superficial skin imperfections, while Revanesse Lips is designed for use in the lips, Revanesse Pure is non-crosslinked for hydration instead of filling, and Revanesse Ultra has a thicker formula for filling deeper lines and wrinkles. All 4 fillers are made of hyaluronic acid. Always clean the injection area with an appropriate antiseptic prior to treatment. Discuss your patient’s desired results to determine the level of correction needed. As well, inform them of all possible side effects and review their medical history. Once they are prepped for treatment, inject this hyaluronic acid filler into the mid-dermis using the provided needle, following proper aseptic techniques. When should I use this dermal filler? This dermal filler may be used to correct fine lines and wrinkles. The duration of this dermal filler may vary depending on the patient’s age, lifestyle, degree of correction, and correct placement of the implant. However, Revanesse results last an average of 6 months. What areas of the body can I treat with this hyaluronic acid filler? You can use this injectable filler to correct fine lines and superficial imperfections on the face. This may include forehead wrinkles, crow’s feet, periorbital lines, and glabellar lines. Who is an ideal candidate for Revanesse treatments? The ideal candidate for these treatments is a patient who has early signs of aging with only superficial skin imperfections or fine lines. The dermal filler can restore subtle volume to superficial wrinkles. Why should I purchase Revanesse? Purchase this dermal filler to help your patients smooth the look of fine lines and other superficial skin imperfections. Since Revanesse is made with Thixofix cross-linking technology, the gel has a more natural feel, making it easier to inject and shape. Additionally, it breaks down more slowly than other hyaluronic acid fillers, allowing patients to maintain their results for longer. This filler is an alternative to the more common Juvederm and Restylane brands, giving your patients broader treatment choices. 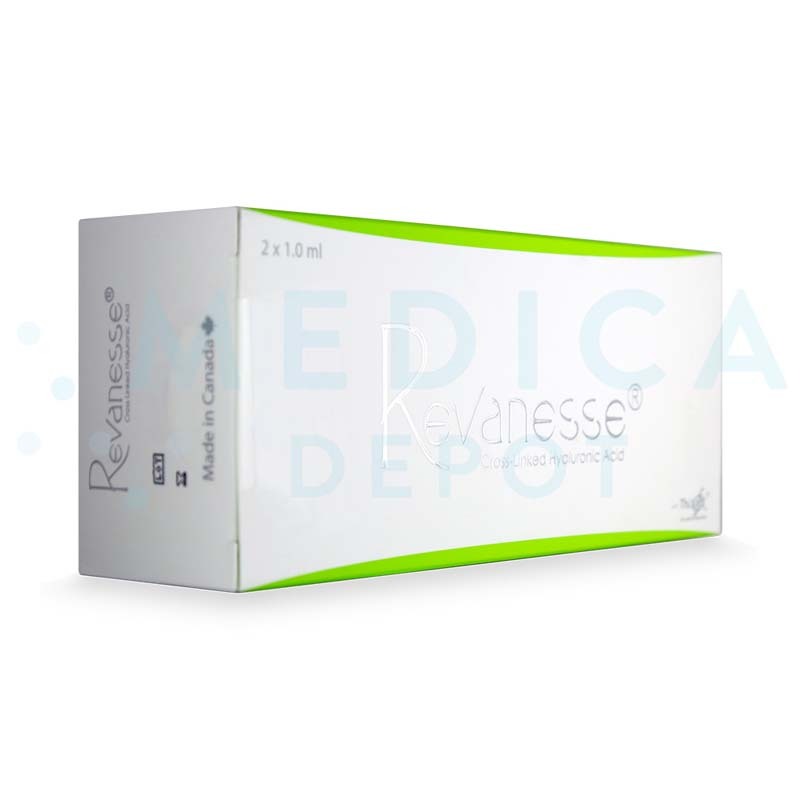 Most of all, by purchasing Revanesse dermal filler from Medica Depot, you save money with low wholesale prices. What are Revanesse’s side effects? Side effects usually resolve themselves within 1–2 days, although this may take up to 1 week after lip injections. These may not be all the possible side effects. Review the product pamphlet for a complete list of side effects, precautions, and contraindications.